Pezi Detective: Giant squids "are much more active predators than previously suggested." 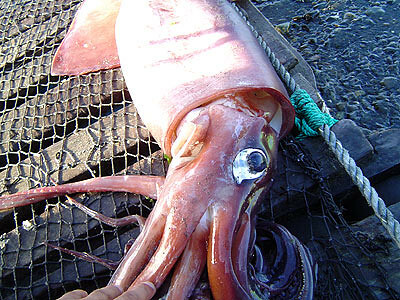 Giant squids "are much more active predators than previously suggested." It's the news that you've been waiting for for a thousand years, brought to you today from the Bonin Islands, 600 miles south of Tokyo. Two Japanese scientists, Tsunemi Kubodera and Kyoichi Mori (I'm even putting their names here because this is such a cool thing), have made the first EVER observations of a giant squid in the wild. They've got four hours of footage of a 26 foot squid (just a baby) trying to free itself from a baited hook that these wily biologists set up at 3000 ft below the surface. "The giant squid, the researchers conclude, 'appears to be a much more active predator than previously suspected, using its elongate feeding tentacles to strike and tangle prey.' They report that the tentacles could apparently coil into a ball, much as a python envelops its victims." Get ready for a revival of AGSMs (Angry Giant Squid Movies) coming your way in the summer of 2006.